EQUIANO (FR) (Bay 2005-Stud 2011). 7 wins-2 at 2, Royal Ascot King's Stand S., Gr.1-twice. Sire of 538 rnrs, 294 wnrs, 14 SW, inc. The Tin Man (Ascot British Champions Sprint S., Gr.1), Belvoir Bay, Medicine Jack, Fly on the Night, King Louis, Lady Horseowner, Baciami Piccola, Lady Macapa, Dark Reckoning, Strath Burn, Alicante Dawn - Furious Boy (H.K. ), Valliano, Waipu Cove - Jolly Convergence (H.K. ), Final Venture, SP Musawaat, Blood Moon, etc. Mysticano (g. by Equiano). 5 wins. See below. SHOELESS (Archway). 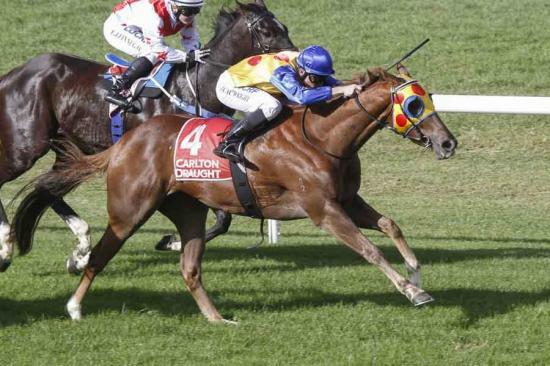 8 wins from 1250m to 2400m, A$233,562, WATC Helena Vale Cup, L, St Leger, L, Geraldton Wax H., Bobaris H., Swell Baby H., Sattler's H., Allan Scahill Memorial H., 2d WATC Anniversary Cup, L, GA Towton Cup, L, 2004 Athens Olympics Welter H., Len Pike H., Easewold H., Wyllie Group H., 3d WATC Perth Cup, Gr.2, GA Towton Cup, L, Evergreen H., Fair Intervener H., Eat Healthy Be Healthy H., 4th WATC CB Cox S., Gr.2, Winter Cup, Gr.3, Hyperion S., Gr.3, Tattersall's Cup, L.
Race Record: 38 Starts 5-5-8 A$108,500. 5 wins to 1200m, A$108,500, to 2018-19, Gawler & Barossa JC Ausbia Electrical H., 2d SAJC 13cabs H., 3d MVRC Inglis 55 Second Challenge Heat H., SAJC Holdfast Insurance H., Ubet H.